We went off from Thurrock to Dover straight through, with no problems to check in for 12.05pm sailing. It was a good crossing and we arrived in good time at Calais. It was a nice day however we encountered traffic between Ostende and Gent but after that we had a good run and arrived at the Hotel for 7.15pm. The weather was great today; I took the clients to Kaag Lake which they all liked. Then I took the clients not doing the Lake trip to Keukenhof, again all enjoyed. On the return journey, I took the group through some of the back roads and we were lucky enough to see quite a few Tulip fields with an array of colours on show, delightful! To begin the day we went to Delfi Pottery, which all of the group enjoyed and then onto the Old Town for a couple of hours. After that we went to Hague, where I managed to get a parking space, luckily, a real trouble for us coach drivers! Then the group walked to Binnenhof (Dutch Parliament) where they were lucky enough to see a Military enactment with guns firing and casualties, thankfully they weren’t real! Next, onto Madurodam, where twenty-one of the group enjoyed the Model Village and the rest went into the Park to enjoy a coffee or beer at the Tennis Club. Today we left the Hotel at 8.30am for Volendam, on the way we stopped at Clara Maria Cheese & Clog Farm, which gave the clients a great opportunity to purchase cheese, which most did! We had an early lunch, as this afternoon we were off into Amsterdam to meet Carol, our guide. It was an excellent tour and afterward a lot of guests took a Canal Boat trip, there was a little free time and then we all returned to Hotel. A good day was had by all. On the final day, we had a smooth journey back to Calais and through to Thurrock. See all our coach holidays in Holland. After a busy Interchange at Thurrock services we departed and made our way round to Beaconsfield to collect our full compliment of passengers. So with my full compliment on board, I introduced myself formerly, told my clients to follow me and we were on our way. Whilst giving my safety speech, I thought of my route to take and headed down the M3 to Rownhams services for a lunch stop. On departing I then continued along the A31 and A35, a very pleasant drive avoiding the motorways. We arrived in Sidmouth at four o clock and were faced with this stunning view. On wakening up this morning at five o clock I went for a walk on the esplanade where our hotel The Royal York and Faulkner was situated. It was so peaceful as the sun rose and the seagulls still were still sleeping. 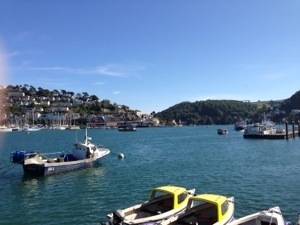 Our excursion today was taking us to Dartmouth for a cruise and Totnes for afternoon tea. On arrival in Dartmouth the sun was shining and my clients boarded their boat for a cruise down the River Dart to view Kingswear and Dartmouth Castles, Sir Walter Raleigh’s boat house, and the estate of Agatha Christie. All clients enjoyed the cruise and on return had free time to have some lunch. We then made our way for afternoon tea in Totnes a lovely market town in the shadows of its 900 year old castle. The excursion was enjoyed by all clients. Today our excursion took us to The Abbotsbury Gardens and the picturesque village of Abbotsbury for an afternoon Devon cream tea. The journey to the Gardens took us along bypassing the historic market town of Dorchester. 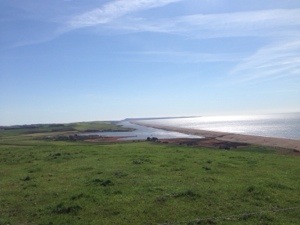 Then we joined the scenic coastal route to Weymouth and Abbotsbury. Along the route we stopped for a photo at the view point to view the Jurassic Coast, the 95 mile stretch of rocks cliffs and fossils. The view to Weymouth, Portland and Chessil beach was very impressive. 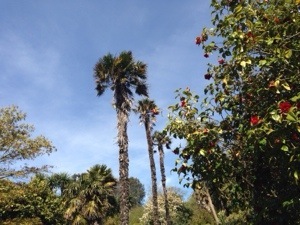 After absorbing the views we made our way to the Sub Tropical Gardens. 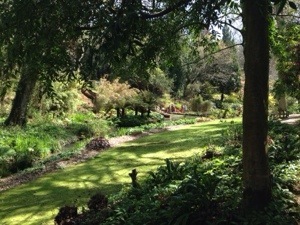 The gardens were very nice and the visit was enjoyed by all my clients. We then made our way to the village for our afternoon Devon cream tea. The old schoolhouse tea rooms gave us a very warm and friendly welcome and provided us with two freshly made scones with jam and cream, and the attentiveness of the staff was fantastic always making sure everything was ok and topping up the teapots. Enjoyed by all we returned to Sidmouth. 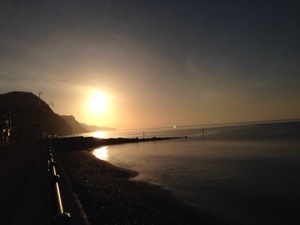 Today was a free day for my clients to explore Sidmouth at their own leisure, so I set my clients a challenge – to find the Loch Ness monster. I think they thought I was crazy but I’m not, in my research I discovered that there is a sculpture of the monster in Sidmouth, and believe it or not clients actually went looking. The unfortunate thing was well Nessie was no where to be seen!!.. 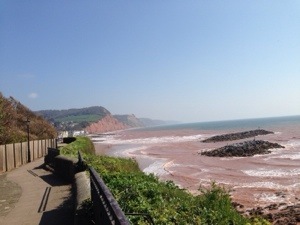 The weather was lovely and in my own exploration of Sidmouth I met some of my clients enjoying their day, the area and off course chips and ice cream. In the afternoon there was a bird of prey display on the seafront, which was very impressive to watch. 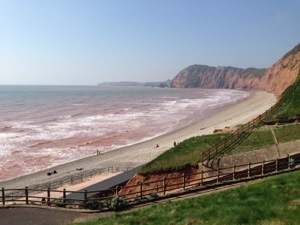 Myself and my clients found Sidmouth a lovely resort with plenty to do and plenty to see. The hotel was in an excellent location making it a lovely holiday with good food and clean comfortable rooms. Well this was the last night of the tour and time to retire before our journey home, but not before catching this lovely photo.